US megachurch pastors might not at first glance have a huge amount in common with campaign activists, but both have interesting thoughts on how you go about building a movement. Jamie Bartlett succinctly describes the ‘activist paradox’ that many movements face in his book The Radicals describing “the way a self-selecting groups of similar people create a powerful shared subculture — ideas, language, received wisdoms, behaviours — that help them bond and commit to the cause, but in so doing create a subculture that makes non-members feel like it’s not really for them”. As someone with a foot in both the campaigning and church community, I’ve a long interested in the lessons that activists can adopt from the church to help them overcome the ‘activist paradox’ that many of us experience in the work that we’re doing. As I was reading Jonathan Smuckers ‘Hegemony How To – A Road Map for Radicals’ earlier in the year, I found myself reflecting back on some of the principles of church growth. A really good summary of those principles can be found in Rick Warren’s Purpose Driven Church. It was a book that was extremely popular within the church growth movement around 20 years ago, and lead to this brilliant paper ‘Purpose Driven Campaigning’ written by Australian agency, on which I’ve drawn some of the lessons in this blog. 1- Be sensitive to those attending for the first time – churches should be willing to adapt what they do when the unconverted are present – they need to be constantly asking if the shared rituals that they’ve developed make sense to those who are attending for the first time. Warren also highlight the need to create an atmosphere of acceptance, that you need to be nice to people when they show up. Obvious advice, but something easy to overlook! 2 – I see your pyramid of engagement and raise you the circles of commitment – As campaigners, we spend lots of time thinking about how we can move people up the pyramid of engagement. 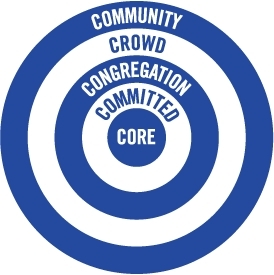 For church leaders, the goal of a church should be to move people from the outer circle (community – low commitment) to the inner circle (core – high commitment). For the community, Warren encourages churches to focus on bridge events that bring them in – think social, think non-threatening, then look to get people in small groups to build connections with others, while for the committed you should look to offer training and for the core to focus on leadership development. See a brilliant article on the principle behind the ‘circles of commitment’ here. 3- Avoid the ‘problem of the core’ -too often in churches a small group who start off something together that they develop a core mentality. Forgetting the original reason that brought them together they such close-knit fellowships which make it impossible for newcomers to break in. Warren encourages churches to take an ‘inside-out’ approach – by focusing on growing from the outside in, by actively designing programmes for each group in the circle of commitment. This is a trap that I see many activist groups fall into, so being aware of the ‘problem of the core’ is key to avoiding growth stalling. 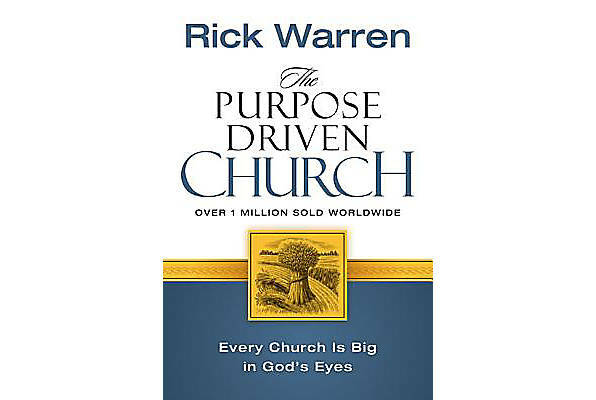 4 – Ensure you a purpose-driven – Warren suggests that churches should restate their purpose on a monthly basis to keep an organisation moving in the right direction, and encourages churches to ensure the purpose of the church is communicated through symbols, slogans, and stories. It’s a good reminder to campaigners that vision needs to be continually highlighted in our communications. 5 – Seek a commitment from people – churches should focus on turning people into active members. The manner in which people join an organisation will determine their effectiveness for years to come. Make them feel special by selling them the vision for what they’ll achieve rather than the cost of getting involved – this to me has parallels with the idea of ‘asking big’ in the Bernie Sanders campaign. 6 – Know who you are fishing for – Warren says ‘people don’t voluntarily jump into your boat so you need to go and catch them’. To do that you need to reach people on their terms, which means thinking about your messaging, offering multiple ways and making it as easy as possible for people to get involved. Again sage advice for those finding ways to help activists increase in number.